Internally displaced Chadian women, who fled Boko Haram threats, living with host families in Baga-Sola. With nearly 200,000 people in Chad in need of urgent aid – 50,000 of them uprooted by Boko Haram terrorists from Nigeria – the United Nations emergency fund today announced a $7 million grant, the second in five months, and called on international donors to provide much more. “This funding is crucial, because in spite of all the efforts made by humanitarian actors since the beginning of the year 2015, the situation remains of deep concern,” UN Office for the Coordination of Humanitarian Affairs (OCHA) Chad Director Florent Méhaule said. “The humanitarian response faces several challenges, including difficulties in accessing the populations in need due to insecurity, as well as a lack of resources,” he said. The funds come from the UN Central Emergency Response Fund (CERF), set up 10 years ago to provide immediate financing for both sudden-onset and long-festering crises, which in August awarded $21 million to UN partners in Sudan and Chad to sustain basic services and protection for millions of people who have fled Sudan’s strife-torn Darfur region. 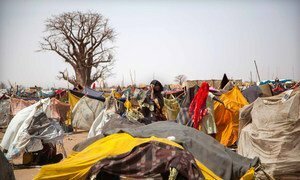 The new aid will assist over 50,000 Chadians forced by violence and insecurity to flee the islands of Lake Chad over the past six months for refuge in dozens of displaced people’s sites, villages and districts in the prefectures of Baga-Sola, Bol, Daboua, Kangalom and Liwa. In addition, 15,000 Chadian returnees from Nigeria, 14,000 Nigerian refugees and over 700 third-country nationals need urgent aid. The displacements have also affected vulnerable host communities, among whom 112,000 people are in need of assistance. “Our priority through this CERF funding, is to bring life-saving assistance to the people mostly affected by this crisis: displaced persons, refugees, and vulnerable host populations, whose livelihood activities - fishing, agriculture, and pastoralism - are limited by insecurity,” Stephen Tull, UN Humanitarian Coordinator in Chad, declared. With nine CERF-approved projects over the next six months, UN agencies along with non-governmental organizations (NGOs) and State services will provide food, protection, health, and education. The funds will be managed by the UN Food and Agriculture Organization (FAO), the International Organization for Migration (IOM), the Office of the UN High Commissioner for Refugees (UNHCR), the UN Children's Fund (UNICEF), the UN Population Fund (UNFPA), the World Food Programme (WFP), and the World Health Organization (WHO). The situation remains very volatile in the lake region, where over 16,000 newly displaced people, not covered by this CERF allocation, have been identified in the western area due to the latest military operations. The United Nations humanitarian chief today allocated $70 million to help provide a lifeline to millions of men, women and children forced from their homes by violence and instability.